The RKI EAGLE 2 is a powerful instrument that does more than just offer the standard confined space protection for LEL, O2, H2S and CO. The RKI EAGLE 2 available features include a PID sensor for detecting high or low ppm levels (0-50 & 0-2,000) of VOC gases; % volume capability for CH4 and H2 using a TC (thermal conductivity) sensor; PPM or LEL hydrocarbon detection at the push of a button; infrared sensors for CO2 (ppm or % volume), methane or hydrocarbons in LEL and % volume ranges; methane elimination feature for environmental applications; and a variety of super toxic gases. The RKI EAGLE 2 has a strong internal pump with a low flow auto pump shut off and alarm, which can draw samples from up to 125 feet. This allows for quick response and recovery from distant sampling locations. The RKI EAGLE 2 will continuously operate for over 18 hours on alkaline batteries or 20 hours on NiMH. A variety of accessories are also available to help satisfy almost any application such as long sample hoses, special float probes for tank testing, and dilution fittings, just to name a few. Datalogging is a standard feature for all sensors on all versions. 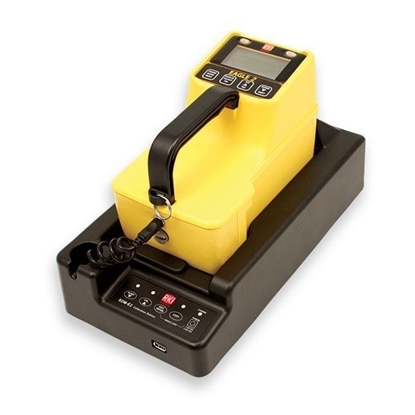 With its ergonomic design and large glove friendly buttons, the RKI EAGLE 2 offers easy access to controls such as autocalibration, alarm silence, demand zero, peak hold, methane elimination, and a wide variety of other features. Each channel has two alarm levels plus TWA and STEL alarms for toxic channels. The two alarm levels are user adjustable and can be latching or self resetting. 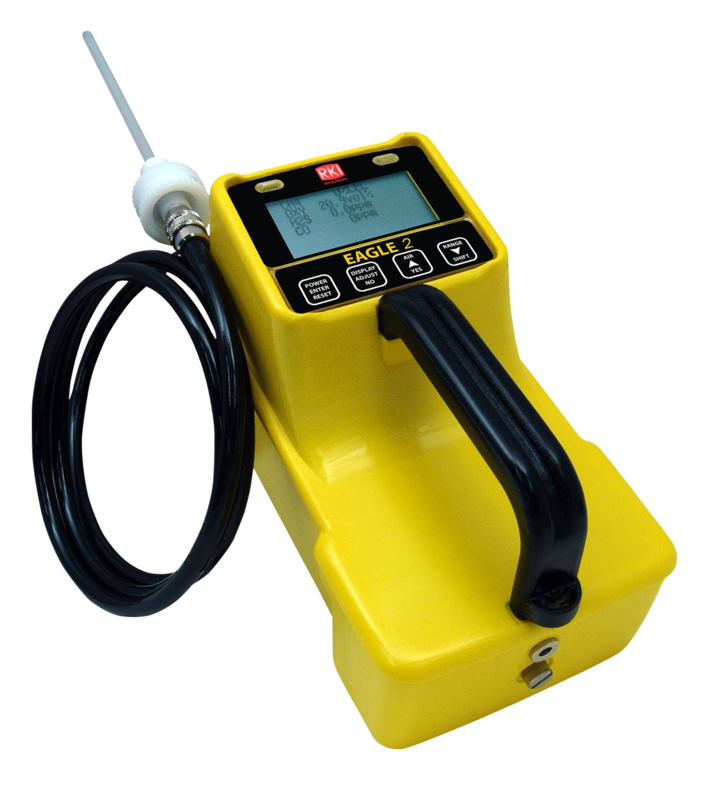 Rugged, reliable, easy to operate and maintain, the RKI EAGLE 2 is the solution for just about any portable gas monitoring situation. Also, the display can be set to any of 5 languages: English, French, German, Italian, or Spanish. Weatherproof, chemical resistant, RFI / EMI coated high impact polycarbonate-PBT blend. Can operate in 2.0” of water without leakage. Ergonomically balanced with rugged top mounted handle. Water & dust resistant equivalent to IP64. Catalytic combustion, electrochemical cell, galvanic cell, infrared, photo ionization detector, and thermal conductivity. 2 Years under normal conditions. 3 display modes: display all gases, large font-autoscroll, or large font-manual scroll. Polyurethane protected overlay. Backlight, illuminates for alarms and by demand with adjustable time. Readout can display in 5 languages (English, French, German, Italian, or Spanish. 2 Alarms per channel plus TWA and STEL alarms for toxics. The two alarms are fully adjustable for levels, latching or self reset, and silenceable. Buzzer 95 dB at 30 cm, four high intensity LED’s. 4 External glove friendly push buttons for operation, demand zero, and autocalibration. Buttons also access LEL/ppm, alarm silence, peak hold, TWA/STEL values, battery status, conversion factors, and many other features. At 70°F, 16 hours using alkaline batteries, or 18 hours using Ni-MH. 4 Alkaline or Ni-MH, size C batteries (Charger has alkaline recognition to prevent battery damage if charging is attempted with alkalines). -20°C to 50°C (-4°F to 122°F), 0 to 95% RH, non-condensing. 30 Seconds to 90% (for most gases) using standard 5 ft hose. The standard RKI EAGLE 2 comes with alkaline batteries. Factory installed rechargeable NiMH batteries are an option. Please see the RKI PARTS AND ACCESSORIES for the various charger options available.